What is a “plan of care”? Medical interventions: These are the activities that are directly related to clinical state of a patient. Medical interventions could include tests, procedures, medications, therapies, or any activity that directly relates to medical diagnosis or treatment. Non-medical interventions: These are the activities that are are not directly related to medical care, but are required to make compliance with the medical plan of care more likely. Non-medical interventions would certainly include nursing interventions, and will also include interventions that may not be automatically associated with nursing activity. Examples beyond standardized nursing interventions (e.g., as standardized by NIC/NOC or Omaha, etc) may include arranging for transportation, training on care issues or nutrition, development of family support structure, or assistance with acquisition of safe, affordable housing. The art of care management is not in defining a plan of care. The art is in figuring out the “best” way to complete the plan (that is, to complete the interventions). In most contexts, the “best” approach is the least expensive avenue to complete the plan. 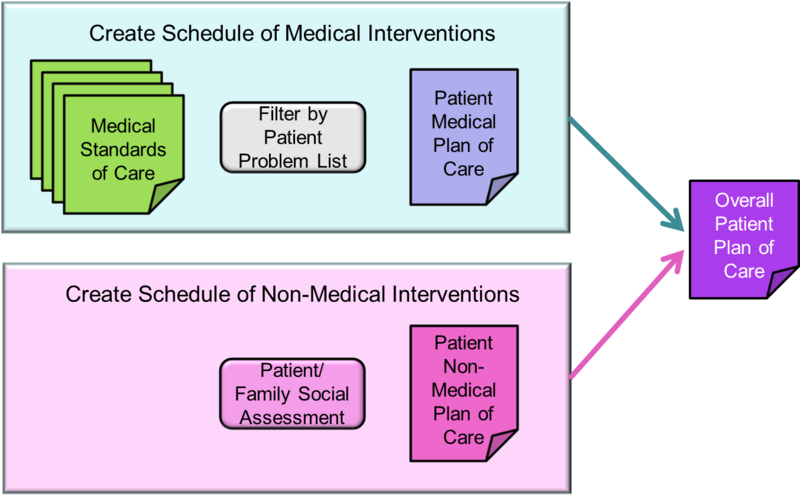 The care team will usually opt for the least expensive approach for each intervention, or to substitute a single (expensive) intervention for a set of interventions that were inexpensive individually, but expensive in aggregate. Often, the least expensive way to get interventions completed is to engage the patient and the patient’s family to assist. Clearly, the majority of medical interventions require a provider for delivery. But the majority of non-medical interventions do not require a provider, and can (and usually should) be leveraged onto the patient/family. If we can get the cost of managing a plan of care down, the result is that we can increase the number of patients who are care management targets. If our only approach to care management is to assign a case manager to directly interact with patients, we are unlikely to get beyond the top 1.5% of patients with an active plan of care. On the other hand, if we can directly engage the patient and family to coordinate care, we are far more likely to be able to manage the 50% of dollars that are invested in the top 5% of patients. If a population incurs an average cost of $10,000 each (which is probably about right for 2014), the top 1.5% is likely to be incurring well over $200,000 each. The next 3.5%, however, are likely approaching about $50,000 each. We have a lot of options to deploy services in this first population where annual care costs are very high and an investment in care coordination of $5,000 or $10,000 could easily pay for itself. We have fewer options in this second population where the cost of care coordination should likely be held to a range of $1,000 to $2,000 per patient per year. In our view, identifying the best way to handle the second-most-expensive population is the middle of the problem. This set of folks is represented in purple below, and is the set of folks that are most likely to be transitioning to higher utilization. They are also probably the most challenging population to include in cost-effective care management services.